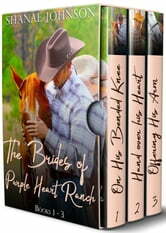 Three SWEET Marriage of Convenience Western Romances in ONE Boxset! Francisco DeMonti has always been a man with a plan. Though his last plan led to his entire squad being wounded on a mission in Afghanistan. Now he’s seeking redemption by getting all the men in his unit hitched so they can stay together and heal. But his own heart is under lock and key due to the shrapnel around it that could kill him at any moment. After years of scraping and saving, Eva Lopez finally steps foot onto a college campus only to be yanked away by the mean streets she came from. A local gang threatens her family’s safety until a wounded veteran offers a reprieve: marry a soldier in exchange for protection and the freedom to attend school. Fran has every intention of directing Eva towards one of his brothers in arms, men who aren’t in danger of a sudden death, but he can’t resist the brainy brunette and proposes to her himself. He’ll protect her for as long as he breathes, but falling in love is futile for a man with a ticking time bomb in his chest. Eva can’t help falling for the man who is making her dreams come true, but when he keeps her at arm’s length, can she convince him to make this marriage more than a convenience no matter how much or how little time they have left? Reed Cannon may be a numbers guy but being minus one arm due to enemy fire hasn’t slowed him down. Now he’s faced with a new challenge—find a bride so he can stay on the rehabilitation ranch that has given him and his squad back their lives. Reed turns to a dating app to narrow down the selection of potential brides. The woman who matches him nearly 100% is accessible online, but out of reach in reality. Sarai Austin has done the impossible, she’s found a great guy online. The problem is now he wants to meet in person, and Sarai's not ready for IRL. Her profile picture was taken three years and thirty pounds ago. To hide her weight issues, she tells Reed she’s out of town on business. All she needs is a couple of months to lose the weight and get back down to model-size. What she doesn’t count on is running into Reed in town. After meeting in person, Reed knows Sarai is the one. But as the two grow closer, their insecurities get in the way. Reed isn’t sure he’s enough for her. Sarai is certain she’s too much for him. When the lies and doubts come to a head, will their relationship be over before it has a chance to begin? I enjoyed these stories. Liked the theme of people who were handicapped in different ways, yet learning to care for others and willing to sacrifice to see needs met. very sweet stories, loved them all. Each had a very satisfying HEA.